When is a smurf not a smurf? For example let’s have a look at Mermaid Smurfette first released back in 1982. We first see Mermaid Smurfette is sitting on a light grey rock, with blue and silver scales, red starfish on hat and wearing a pearl necklace in the 1982 Schleich catalogue. This version was typically made out of blue pvc material. A version of Mermaid Smurfette was also made out of Hong Kong, which has a dark green scales, orange starfish on hat and is wearing a pearl necklace. It was also made out of white pvc material. This was sold by BP in Australia and New Zealand possibly in 1982 and then in 1983 was sold by Wallace Berrie for two years. The markings for Mermaid Smurfette can be found underneath the rock. It can also be found with different paint dots; mustard, green or red which was used as a method of quality control. It tells us which country the smurf was painted in by Schleich. Mustard indicates it was painted in Portugal. Green indicates it was painted in Tunisia. Red indicates it was painted in Sri Lanka. Though it is a strange choice of a smurf figurine, it must have been fairly popular it was sold by Schleich between 1982 to 1988 and then again 1993 to 1996. During this time, it was also used on several triangle pedestals. 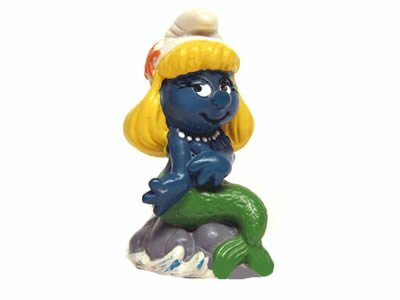 OMO back in around 1983 also created a miniature version of Mermaid Smurfette made out of blue material. These miniature smurfs came free inside a box of OMO washing powder. A total of 16 were produced as part of this promotion. In 2009 Plastoy produced smurf bath toys which included Mermaid Smurfette with a silver tail. The smurf bath toys were produced as two sets of four different smurf characters. Mermaid Smurfette was part of set 1 which also included a smurf riding an orange fish, Diving Smurf and a smurf sitting in a rubber duck tube. These pieces make a beautiful to your smurf collection especially if you like to display the pieces. So what inspired the creation Mermaid Smurfette? Who knows and who cares. Whoever it was, created a beautiful figurine to be admired when displayed with other smurfs.